Because of the processor's state machines mentioned earlier, you must purposely make it start out in a known state to begin orderly operation. This is what bringing the RST (reset) pin low and then back high does. It must be held low for at least a couple of clock cycles. If the computer is just powering up, you cannot start counting those clock cycles until the clock has reached stable operation, putting out a strong square wave on the right frequency. After the reset signal comes up, the processor takes six clocks to set itself up internally before starting into your programmed reset routine. The reset sequence includes reading addresses $FFFC-FFFD to find the real address of the beginning of the reset routine where it should start executing. Later we'll discuss what should be in that routine. Just putting a pushbutton on it with no debouncing will not be adequate. Switches have a lot of "bounce;" meaning that when the contact is made, it is not suddenly "on" and stays on. It will go off and on, "bouncing," for a few milliseconds, and the number and widths of the bounces could be just about anything. At least some of the CMOS 6502's have Schmitt-trigger RST inputs; but for this writing, I was not able to find out which ones. Certainly not all the I/O ICs do. There are many ways to get a clean, single, fast rising edge for a good reset signal. 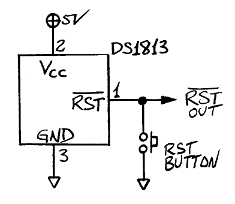 Just putting a resistor and capacitor on the RST input won't do the job for ICs that don't have Schitt-trigger reset inputs. Now if you really must use an old NMOS 6502 (I don't recommend it), you should be aware that some NMOS 6502's had an internal heating problem that could damage the part if the reset line was held down very long. It is recommended that you not hold it down more than about a tenth of a second. 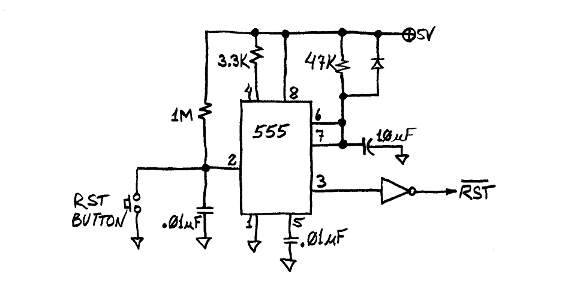 The following circuit debounces the button and produces a reset pulse of about 80ms. You might recognize it from earlier in the Clock Generation section where it was used for single-cycling; but the values have been changed to increase the low time from 1µs to 80ms. The exact times will depend on not only the values in the second RC (shown to be 1µF and 82K here) but also the size of the hysteresis of the second Schmitt-trigger input.